In many ways, the motor vehicle has shaped modern society and the urban areas in which more than half of us live. But as global incomes rise, cars and trucks are choking these cities with deadly pollution and productivity-sapping traffic jams. More than a million people are killed in motor vehicle accidents each year, and many more are threatened by transportation’s contribution to global warming. Imagine instead a world where fleets of autonomous vehicles that are electric and shared (FAVES) slash the number of vehicles on the road by as much as 90%. Hailing and paying for a ride or delivery is as easy as tapping a smart phone app. Car loans and insurance payments shrink or disappear because renting a vehicle when it would otherwise sit idle (or feeding electricity back to the electric grid) more than pays for it. Perhaps best of all, imagine wider, less congested streets with more room for pedestrians and bicycles, clean air, much less global warming, shorter commutes, and even “crowd-funded” fleets of vehicles whose routing and pricing software is tuned to minimize energy use or provide low-cost transportation to underserved regions. All these benefits are enabled by two emerging technologies that are rapidly becoming mainstream. The first is the self-driving vehicle, guided to the quickest route by real-time traffic updates and to the next customer by real-time passenger requests. The second is blockchain-enabled, secure peer-to-peer (P2P) transactions that eliminate or minimize the need for centralized authorities such as banks or ride-sharing services such as Uber and Lyft. The security of blockchain will allow owners to directly rent out their vehicles under terms and conditions they set themselves. Using blockchain, trip charges will be automatically deducted from the passenger’s blockchain-enabled digital wallets or charged to their credit card, with payment instantly flowing to the vehicle owner. Access and identity tokens and P2P transactions will enable the easy, secure sharing of not only vehicles but infrastructure such as toll roads, recharging stations and parking lots. The blockchain-enabled identity of each user will carry proof of identity, age, insurance coverage and ability to pay, while protecting the anonymity of the passengers and information about their travels, as well as the security of their payment mechanisms. The smart contracts governing such transactions will be based on standard templates that assure accurate, instant collection of taxes and regulatory reporting, wherever the trip takes place. The warning signs for the old order are already appearing, as are the building blocks for the new world of transportation. Even as producers promise commercial sales of fully autonomous cars by 2020, some analysts predict such self-driving cars could cut US auto sales by 40%. Tesla has announced plans to allow owners to loan their cars to a shared autonomous fleet when not in use, “significantly offsetting and at times potentially exceeding the monthly loan or lease cost”. Other automakers, seeing the threat to their existing business model, are already investing in ride-sharing services. In the short run, blockchain will allow any vehicle owner to enter the transportation market without barriers to entry such as paying a fee (and agreeing to the terms of) centralized ride sharing services or paying a bank to process payments. With blockchain-enabled mobility, all providers and consumers can equally participate in a transportation system, setting the terms, conditions and pricing they choose. 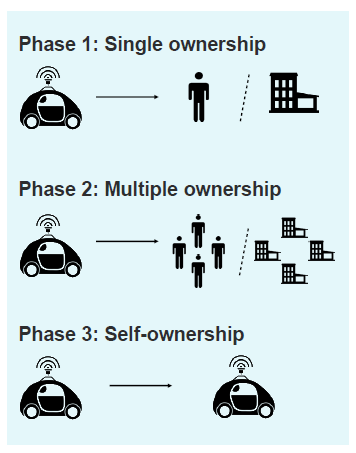 Eventually, the vehicles themselves may become “economically independent” with their own profit and loss statements, making independent decisions (based on algorithms and real-time information about everything from demand levels to the prices of repairs and recharging) to maximize either the owner’s profit or the good of society. Over time, ownership models will evolve. By registering vehicles on the blockchain “ownership” and “access” will be tokenized, meaning owners can trade their shares in the vehicles or their rights to use them directly through the blockchain without the involvement of third parties. Some vehicles will continue to be owned by individuals or legal entities. Others will have multiple owners whose identities and shares in the vehicle can change in real time. Car companies will not necessarily generate sales via car dealers. They will simply deploy cars in areas where their use can generate an economically viable cash flow, and trade ownership to other parties when algorithms show that would maximize cash flows. Secure, immutable information about the ownership and usage of the vehicle will be stored on the decentralized platform. As P2P marketplaces become more mature and consumers become more comfortable with “ownerless” transportations, some vehicles may “own” themselves as economically autonomous entities. It’s important to note how different this model is from current ride-sharing services such as Uber and Lyft. Autonomous vehicles eliminate the cost of human drivers, while blockchain eliminates the middleman that matches customers with rides, charges a transaction fee and sets terms and conditions. Mobility on decentralized platforms may also become one of the most visible and dramatic examples of a zero marginal cost economy in which owners of everything from homes to cars rent them out when not in use, driving the marginal cost of each overnight stay or trip close to zero. In such a post-capitalist economy, knowledge rather than capital or labour is the foundation of wealth, and traditional drivers such as supply and demand and the need for profits are supplemented by more collaborative, communal models that prioritize social good alongside shareholder profits. For all the possible benefits of this new model, there will be potentially devastating impacts on significant portions of society, including many in low-skilled or semi-skilled jobs. These range from taxi and delivery drivers to auto assembly, repair and maintenance workers. In the US alone, governments will face the potential loss of some of the $206 billion a year in taxes associated with motor vehicle manufacturing and use. Ignoring these negative impacts, or addressing them with reactive and piecemeal strategies, is a recipe for chaos and resistance from those most hurt by the short-term changes. Now, before the full force of these changes is upon us, is the time for innovative business leaders to join government and civic leaders to reimagine not only our transportation systems, but how to manage the transition to FAVES and blockchain-enabled transportation systems so the benefits and not just the costs are immediately apparent and available to all. Technologist are already working to leverage open source, blockchain-based standards to allow the most efficient routing, pricing and payment for trips spanning public transit, private ride sharing and peer-to-peer rental of FAVES. Regulators and lawmakers must decide how to replace tax revenue lost through lower vehicle use and to clarify liability and insurance requirements for FAVES, especially those that become their own economic entities. Government and civic groups will need to work together to mitigate the impact on those who lose jobs to FAVES. The benefits are too immense, and the risks too great, to repeat the mistakes of the past with FAVES and decentral mobility platforms. The time is now to begin thinking, planning and acting together to transform our transportation system, and our cities, in a way that benefits every member of society.